New leaks suggest that the 4.5 W Kaby Lake Y series will have Core m3/i5/i7 SKUs instead of the expected Core m3/m5/m7 SKUs. 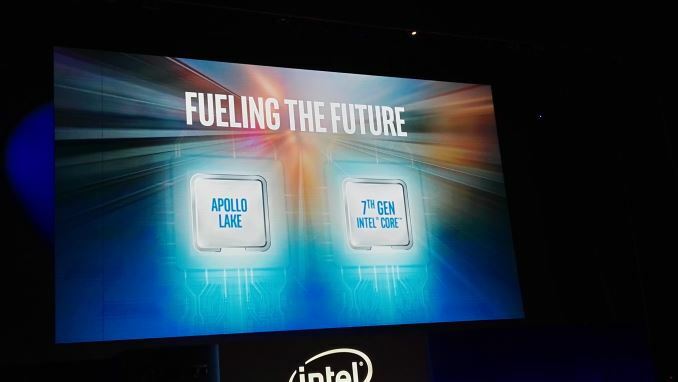 Intel Kaby Lake is just over the horizon and will likely be a large focus at this year's Intel Developer Forum in San Francisco taking place on August 16th through the 18th. More notebooks, tablets, and convertibles sporting the platform should also be coming to the International Consumer Electronics Fair in Berlin in early September. 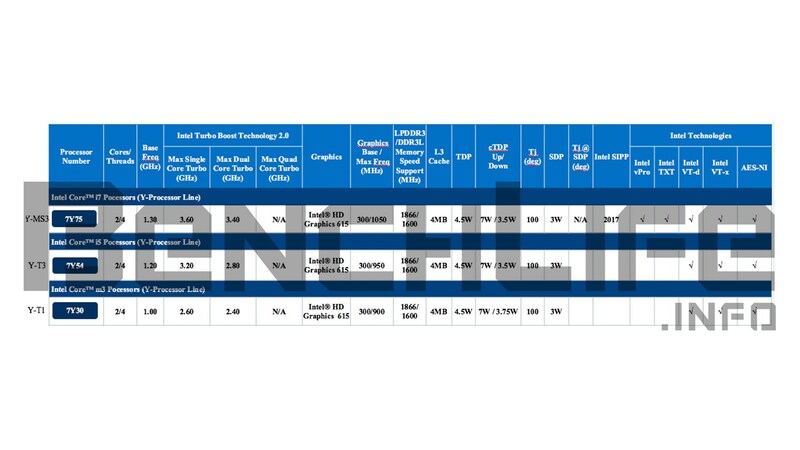 Chinese source Bench Life has now revealed more insight on some of the first SKUs based on Kaby Lake and the slight changes to their naming. Interestingly, Intel may be slowly phasing out the Core m series. 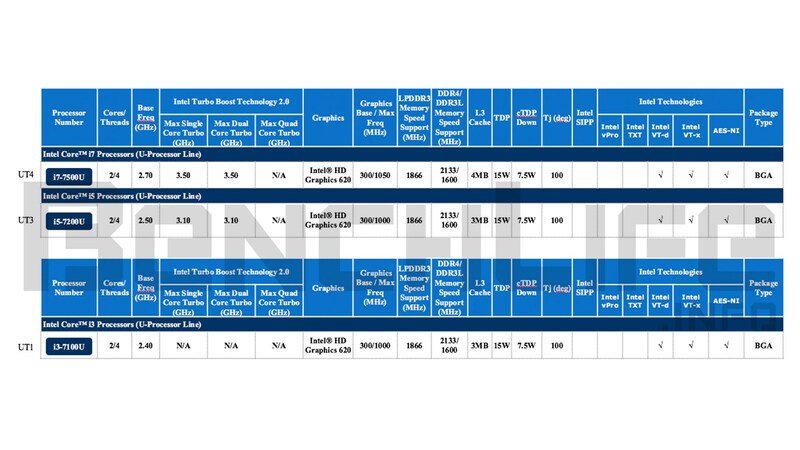 Aside from sounding too much like the failed Pentium M series, more manufacturers are now able to fit Core ix CPUs into very thin designs including the HP Spectre 13 and the upcoming Asus Zenbook 3. 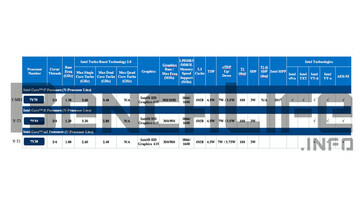 The Core m series also has a reputation of being under-powered even up to its m7 offerings. 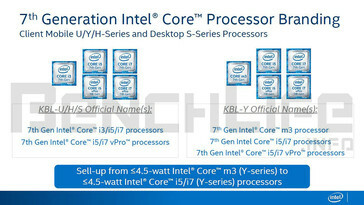 The Kaby Lake Y series and its low 4.5 W TDP, for example, now includes Core i5 and i7 SKUs instead of the Core m5 or m7. The only exception is the very low-end offering with the Core m3 7Y30. One step up from the Kaby Lake Y series is the familiar U series. According to the source, Intel will launch its first round of SKUs without vPro support, so early business notebooks sporting Kaby Lake may miss out on this important feature or will simply be delayed until Intel can provide the proper solution. Thus, notable business models like ThinkPads, Latitudes, and EliteBooks will likely come sometime after their consumer counterparts have made it to market.